No question about it… aqua park is the best and most universally thing for holidays. This is loved activity for our children and kind of way to keep cool in to the hot sun in the summer… The Bulgarian resort Sunny Beach has the best aqua park in whole Balkans. Our advice is to make this activity part of your lovely holiday in Bulgaria. It is very easy to reach aqua park of sunny beach when you arrive, that is a plus, right? 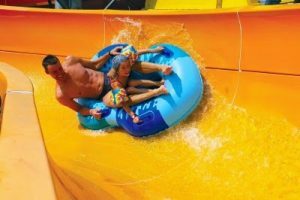 The aqua park is kind of huge in sunny beach resort it is over 24 square meters, this aqua park have something for everybody, for whole family, from the 40 year old to 4 year old. Your kids can have fun in different pool then elderly and still have a lot of fun, because this kid pool had its own attractions… So they will be happy and you can have fun as well. The attractions include a lot of things, we will just mention a part of them, for example pirate ship, toy crocodile and four turtles (not real ones of course). The second tier is kids that is a little bit older like 12-16 year old. For them there is a lot of attractions that is very adrenaline intense, they will fell amazing, no question about it… That’s because they will experience vertical Kamikaze and the mighty bendy “Hydrotube”. The adults will be surprised that there is a hidden gem in the pool. He is large and there is a very special sound system that distributive music underwater, so it is a lot of fun and you will listen your favorite song below, amazing right? When we are done with your private activities you can try racing each other in the multislide and you will be surprised how much mommy wants win this things! To be continue … with part 2 where we described Aqua Paradise in Sunny Beach. Why Croatia is attractive for holidays? – Just 4 strong reasons!